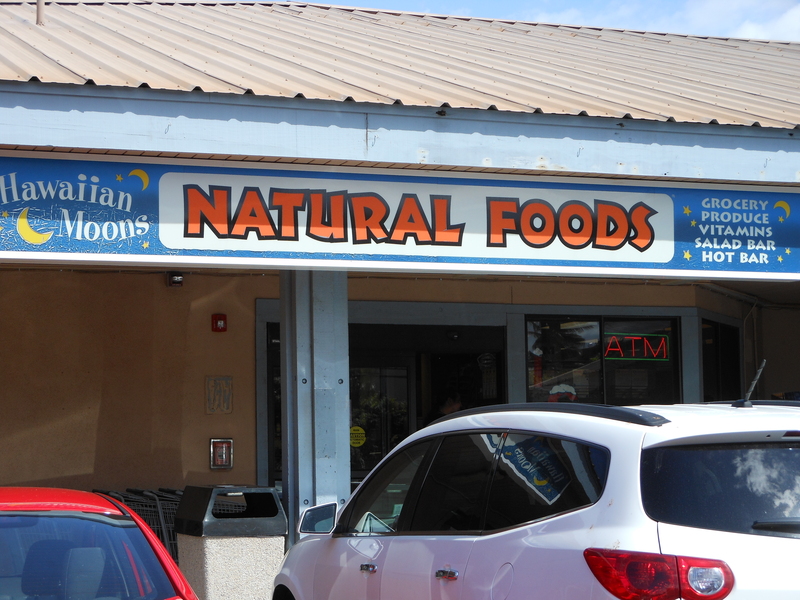 Up in West Maui, just off the highway 4 miles north of Kaanapali, is the nondescript Kahana Gateway Shopping Center. Its chief distinction is being home to the only local (and quite successful!) brewery on Maui. There are lots of good beers on the island, but only those made by the Maui Brewing Company are made on Maui. And many of them are very, very good. Founded in 2005, the Maui Brewing Company has won numerous awards for beers with names like Big Swell IPA, Bikini Blonde, and Coconut Porter. If you like beer, you’re sure to find something that fits your taste at the Maui Brewing Company. We LOVE the Coconut Porter. Check out this list. 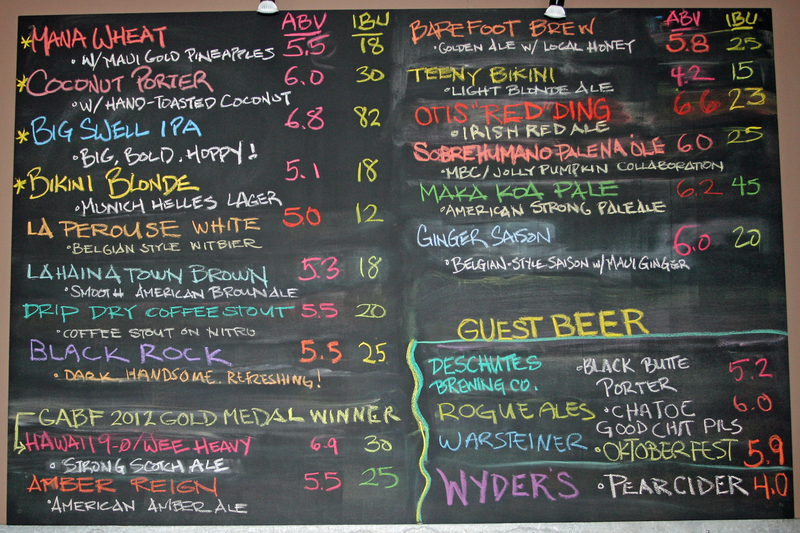 The ABV column in this list is alcohol by volume – a pretty objective measure. The IBU column stands for International Bittering Units – a more subjective measure of the effect of hops on beer taste. You can see the brewing vats in action. It’s very casual with lots of TV’s, all playing sports. 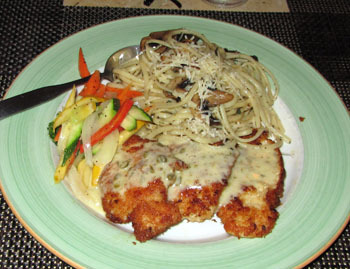 The food is decent pub grub with efforts toward a Hawaiian twist. We enjoy the variety of sliders at just $4 or $5 each. A slider or two, a side of fries and a home-style brew is well worth our drive from Kihei to Kahana. In fact, we wear our Maui Brewing logo shirts on Wednesdays and get a $3 pint! If you can’t make it to the brewery, or if you’d perfer a nice Hawaiian view with your suds, ask your bartender what’s on tap from the Maui Brewing Company. Lots of places carry one or more of their brews. 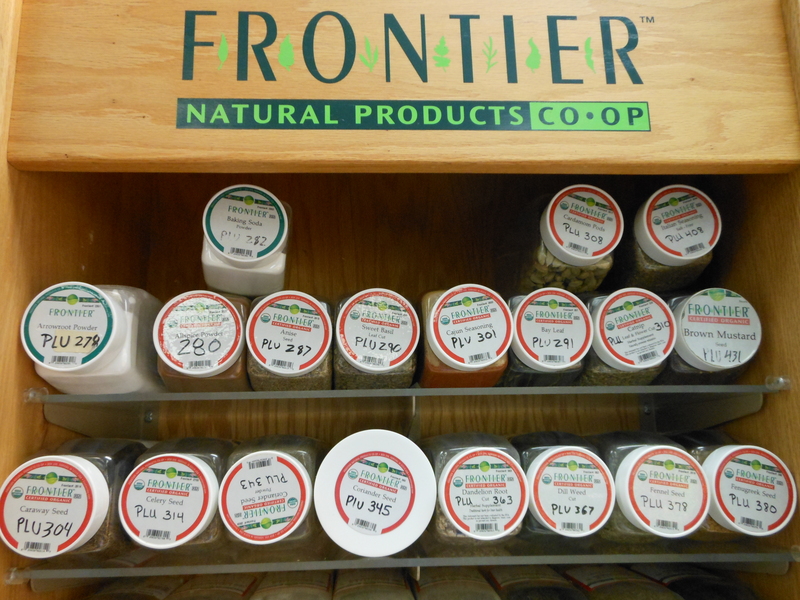 Many grocery stores do also, but we prefer it from the tap! 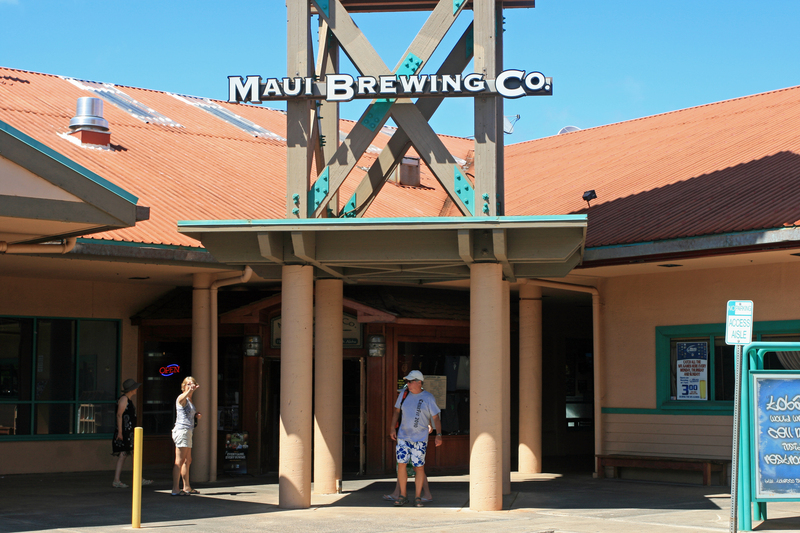 For exciting news about Maui Brewing’s plan to build a brewery and pub in Kihei, click here. If you drive as far south as possible through Wailea, Makena, and beyond, you come to La Perouse Bay. The drive takes you past Big Beach, through the Ahihi Kinau Reserve, and across a long stretch of lava from the last eruption of Mount Haleakala in 1790. After the manicured beauty of Wailea, the road gets narrower. Later it gets even narrower. Finally, it gets so narrow there are pull outs so cars going in the opposite direction can pass. The last few hundred yards are so bumpy you may want to park before the last turn toward the bay. Look for the horse corral and the stone monument. You can park there or bounce over the last bumps until you get to the water’s edge. It’s about 25 minutes south of Maui Vista. 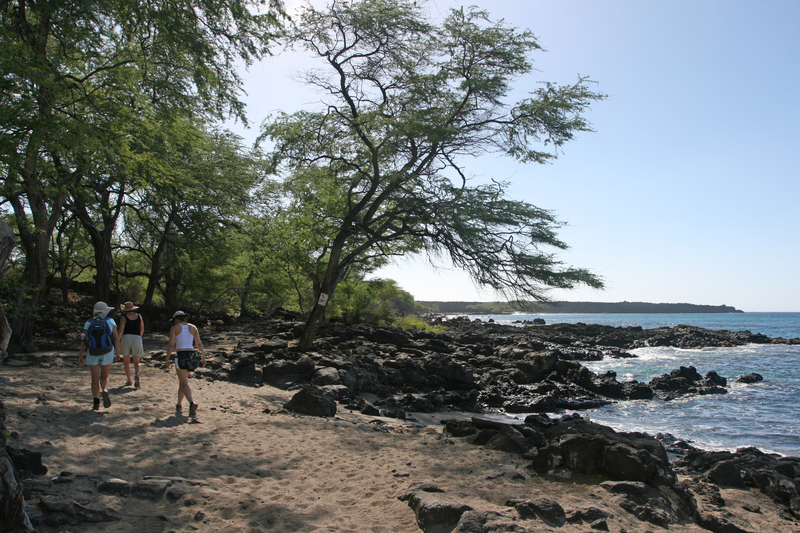 The Hoapili Trail starts a few yards from the water’s edge on your left as you face the bay. The first portion of the hike is though a lava field. This, and other parts of the trail, need real shoes, not flip flops or sandals. Tennis shoes will do, walking shoes are better. There are cultural artifacts in the lava fields – the lower walls of shelters built by Hawaiians sometime after the 1790 eruption. There’s not much to see, but some people find them interesting. Look for the a small blow hole about halfway across the lave field. If the tide is high and the surf is up it makes a good splash. A pretty bay greats you at the end of the lava field. 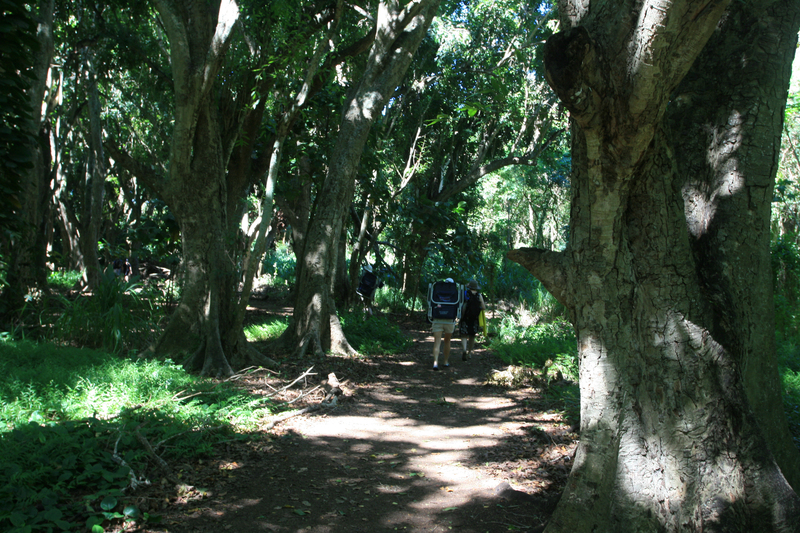 After that you walk under the welcome shade of mesquite trees (locally known as kiawe). Lots of feral goats here. Keep a lookout for a surfer memorial on your right after you’ve walked for 5 or 10 minutes. As you come out from under the trees you have three choices of route. You can keep on the “road” which will take you to the next shady grove or on to your destination at the end of Cape Hanamanioa. Alternatively, you can turn off the road through the broken wire gate and follow the King’s Highway cross the second lava field until you come to a sign that tells you it was reconstructed in its present form during the first half of the 19th century. If you take this route, turn right at the sign to return to the road or to the second grove. Finally, you can walk along a very rocky beach to the second grove. 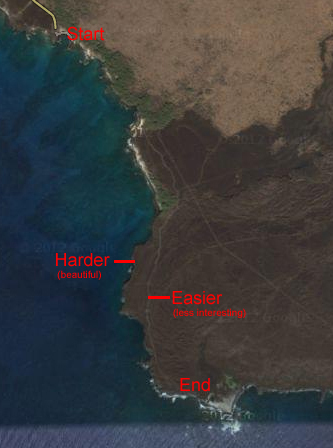 As indicated in the map above, once you get to the second grove, there is an easier and harder route to the end of Cape Hanamanioa. 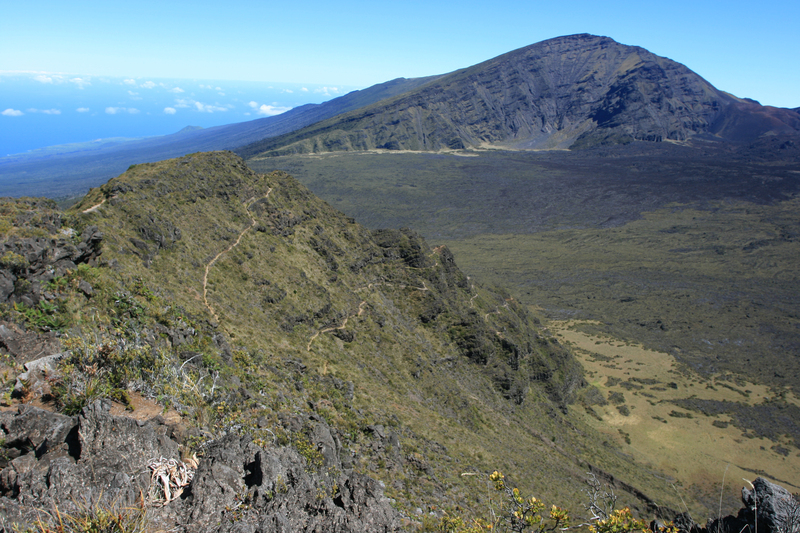 The easier route is fairly boring, with little to see but lava and views in the distance. The harder route takes you along high cliffs over sometimes rough terrain with spectacular views of the bay and beyond. The water is multi-colored shades of crystal clear blue. Sometimes the trail is hard to find. Persevere, the rough parts lead to an actual trail. It’s often very windy at the end of the cape – hold onto your hat. One way distance from start to finish is about 1.25 miles. It will take you longer than you think. From the end of the cape you can return or follow more trails (for miles) onto new coves, beaches and interesting sights. Enjoy. 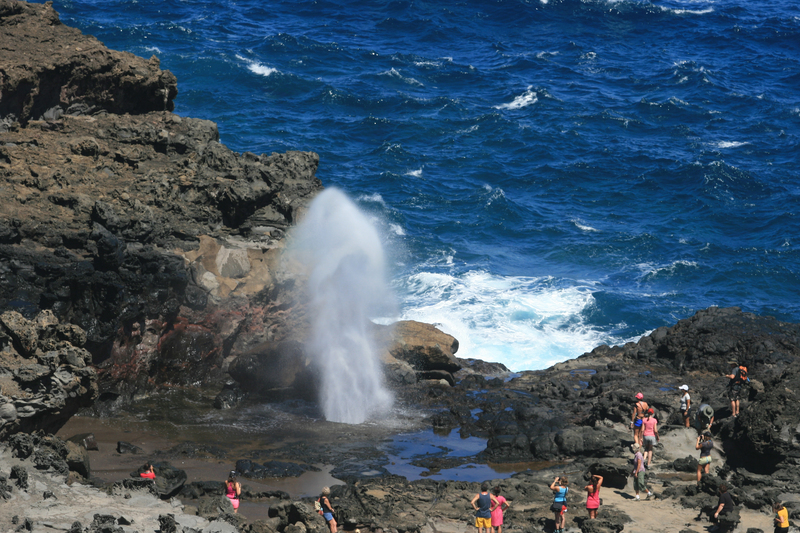 When exploring west Maui, consider a trip to the Nakalele Blowhole. It’s a 10 minute drive past Honolua Bay on the north shore. Look for a dirt parking lot on the ocean side of the road about a half mile past mile marker 38. If you can see a white navigation light near the shore, keep driving unless you want to take the long walk to the blowhole. A little way around the next bend is another dirt lot where the hike is much shorter. It’s not far to the blowhole but good views can be had after a very short walk. For example, the pictures in this post were taken from a vantage point less than 100 yards from our car. There’s so much good snorkeling not far from Maui Vista (see South Maui Snorkeling – 3 Favorite Spots), why drive an hour to Honolua Bay? There are plenty of reasons. 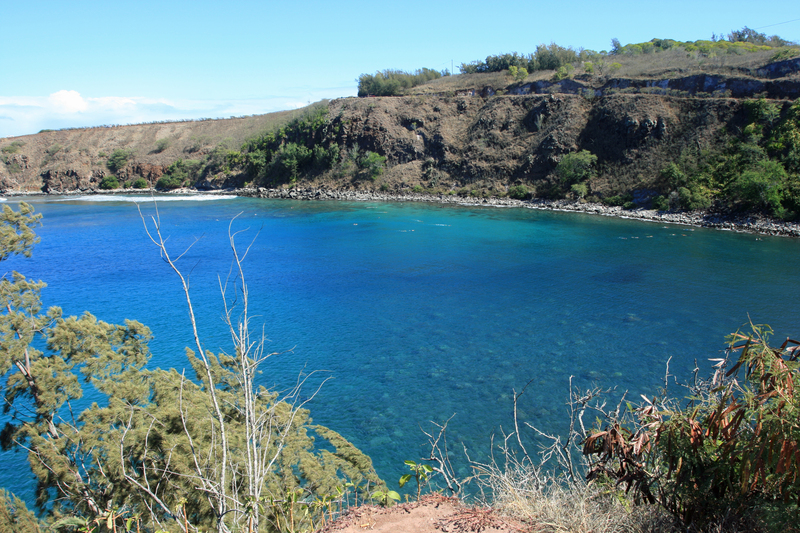 First of all, Honolua Bay is a spectacular snorkeling spot. 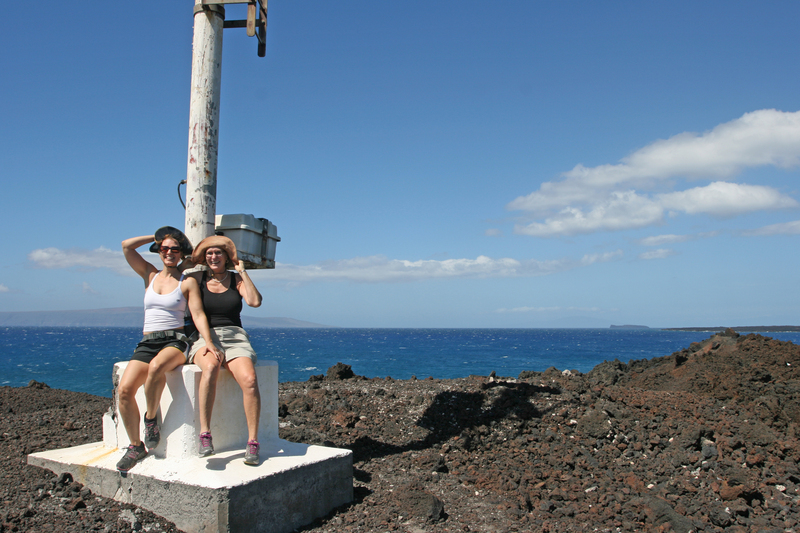 In addition, there are lots of other fun things to see and do in West Maui. 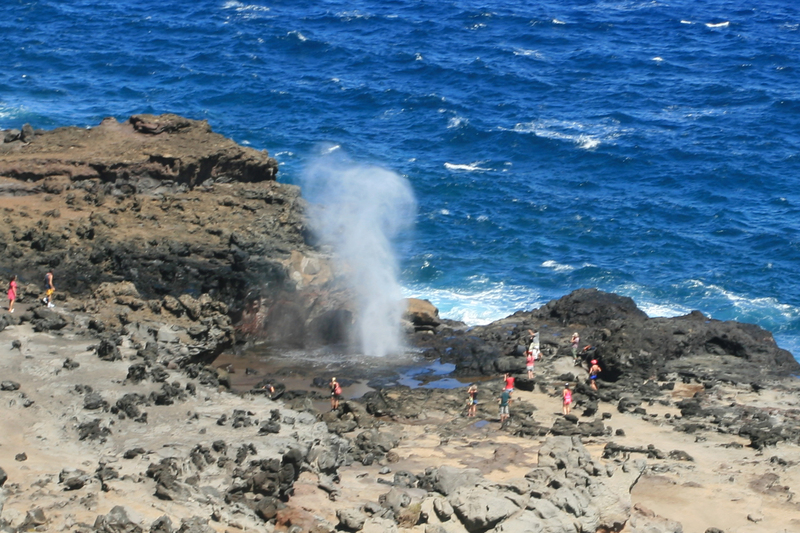 For example, the Nakalele Blowhole is just another 10 minutes down the road past Honolua Bay. 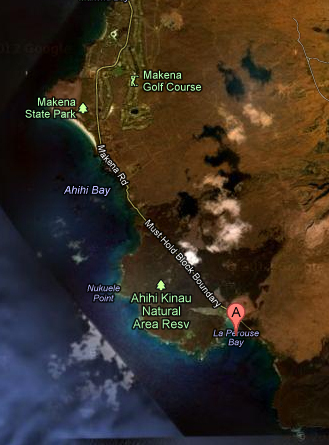 To get there from Kihei, head north on South Kihei Road or the Pi’ilani Highway and follow the signs to Lahaina. Continue north on Highway 30 through Lahaina, Ka’anapali, and Kapalua. When the road narrows and slows for tight, blind curves, you’re almost there. 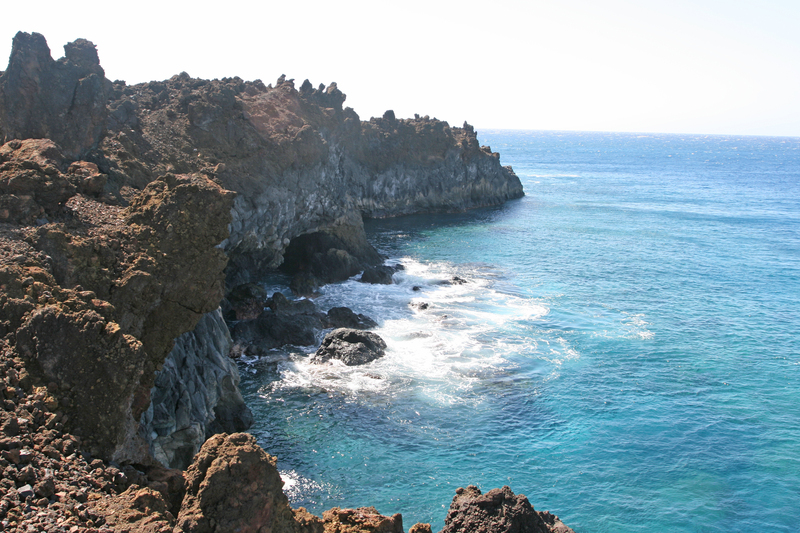 Stop at the overlook (pictured above) and check out conditions and the best snorkeling spots. (If you click on the picture and blow it up you can see snorkelers and areas with coral – that’s where you want to be.) If the surf’s up, the snorkeling won’t be good – but there will be surfers to watch. You can watch from the overlook or, better still, drive around the bay and turn left onto the dirt road high on the other side side of the bay. Find a parking spot and walk out for the best views (see Surfing the Big Water at Honolua Bay). For snorkeling, drive to the bottom of the hill and look for a parking spot. If you don’t see one at first, keep driving – there are several other areas where people park. You’ll find a trail near each parking area. All trails end up at more or less the same place. It’s a pleasant, but surprisingly long, walk to the water through a shaded grove. People do it in flip-flops, but a sturdier sandal or shoe is recommended. The beach itself is rocky with few places to even put a beach chair. There are no restrooms, no water, no garbage cans, no nothing – except begging chickens and great snorkeling. The wet and sometimes slimy rocks near the shore are slippery. Lots of people get in from an old broken boat ramp that the two people on the left side of the accompanying picture are standing on. Most people snorkel on the right side of the bay, but there is plenty of coral on the other side as well. It’s a fairly long swim before the viewing gets good. If you’re not a strong swimmer, you might want to take a boogie board or a noodle. At first the coral and fish are mainly close to the shore on the right. As the coral gets denser you’ll see it expand out toward the middle of the bay. Explore this area to your heart’s content. A word to the wise: several large snorkel boats anchor at Honolua Bay around mid day. If you want to miss the crowd in the water, go early. If they’re there when you are, just remember that they’re paying the big bucks while you’re getting the same views for free. Enjoy! Café O’Lei sounds Mexican, but tastes Hawaiian. This restaurant is an easy walk from Maui Vista 2418 and wow is it good! You’ll find it across the street from the Royal Mauian, between Kameole Beach Park I and Kameole Beach Park II. It doesn’t look like much from the outside, but inside it is elegant and comfortable. Be aware the lunch hour can be quite loud. Dinner was more subdued. Although the menu might look a little pricey at first, the delicious portions are generous and include salad, main course, steamed veggies and rice. Kathy’s blackened Mahi Mahi was enough for her dinner and two lunches the next day. 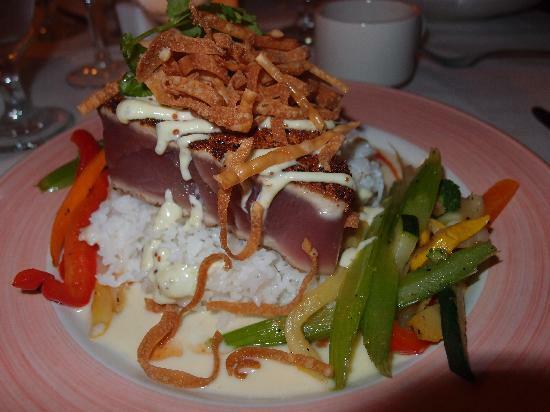 Chris managed to finish his seared Ahi which was also worth writing home about. 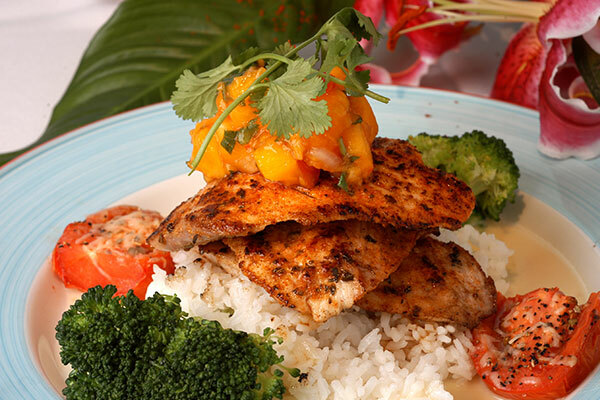 Café O’Lei is known for their coconut/macademia chicken, so we plan to try that next time. The refreshing cocktails are original, yummy and only $7 each. We were too full for dessert. 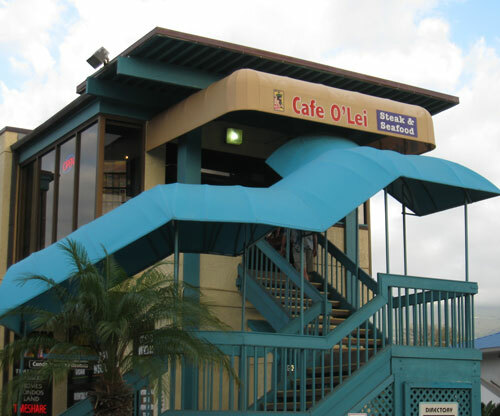 We highly recommend Cafe O’Lei! Dust in our eyes from the Sliding Sands Trail blew us off the top of Haleakala. We decided to try our luck with the Halemauu Trail. The parking lot at the trail head is clearly marked just below the 8,000 foot level. We were greeted by a couple of overly friendly Nene. The composting toilet at the parking lot was spotless the day we were there – hand sanitizer and everything. The first part of the hike is gently downhill through native scrub. While still a little windy, it was much more pleasant than at the top of the mountain – no dust and occasionally a little shade. The first approach to the crater’s edge is spectacular if somewhat daunting. The switchbacks in the photo below descend almost 1,000 feet to the valley floor. Click on the photo to enlarge and zoom in on it. While not as common as on the Sliding Sands Trail, people ride horses up and down those switchbacks. The round trip from the parking lot to the Holua Cabin on the valley floor is an arduous 8 miles. It can easily take 4 to 5 hours. Bring food and plenty of water. 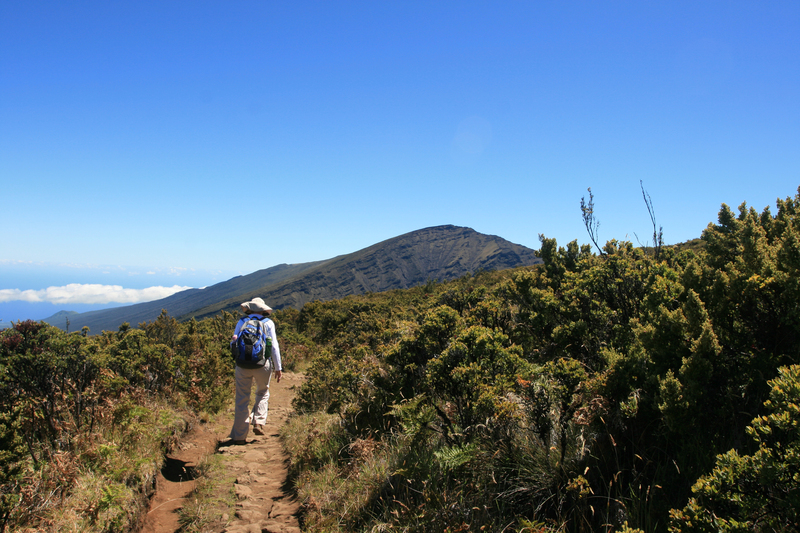 As with anywhere at higher elevations on Haleakala, bring layers of clothing. It can get very cold. You’ll also want to bring your camera. The views of the Ko’ olua Gap and crater interior are spectacular. 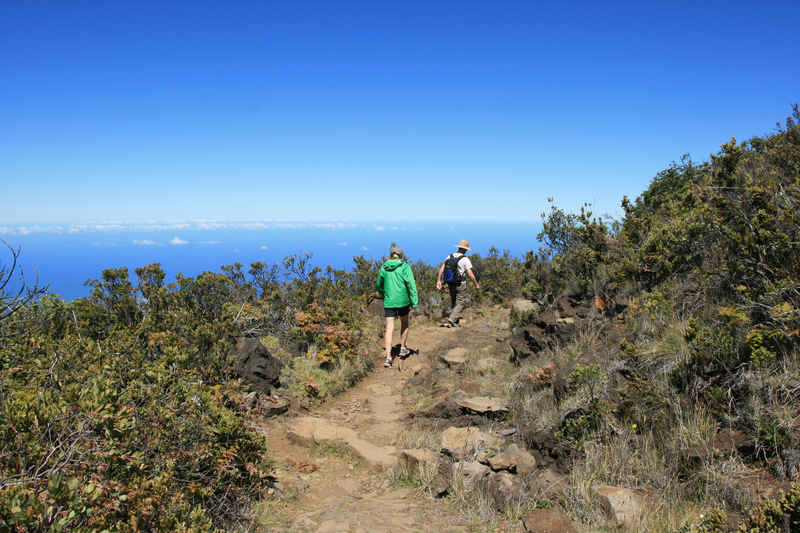 For an easier hike with all sorts of amazing views, take the one mile hike to the end of the ridge jutting out into Ko’ olua Gap. We stopped there for a picnic lunch. Click here to see our blog on the Sliding Sands Trail.